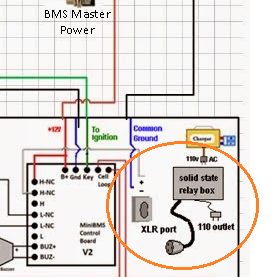 Solid state relays are pretty neat. 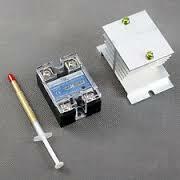 They operate just like traditional electromagnet relays but have no moving parts to fail. Just provide a small DC voltage in to the low voltage terminals and 110V will then be allowed to pass through the other terminals. At the time I purchased my relay, I wasn't sure how much heat they would generate. So, I purchased the optional aluminum heat sink. To be extra careful, I also figured a small PC fan could be used to carry the heat away. However, I was faced with a problem. Where do I fit all this stuff? Since there wasn't much room within the BugE, I used an external solution. I happened to have an old PC power supply box. After removing the insides, I found it provided just enough room for the relay, heat sink, cooling fan and a 110v outlet to plug the charger into. The resulting box is shown below. When I want to charge the BugE, the 48v charger plugs into the top of the box. The box then plugs into the side XLR port to get it's logic signal. The box then gets plugged into the wall (short cord shown for the photo, a larger patch cord to reach the wall is used instead). 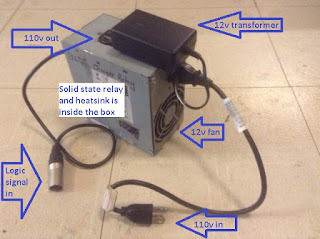 The black box on top is a plug-in 12v transformer to power the fan. The fan cools the heat sink and it's sound also indicates the box is passing 110v. It's not too elegant looking, but it works.